On this Veterans Day 2013, I’m feeling grateful for all of the soldiers throughout our nation’s history — including my father and my father-in-law, both of whom fought in Vietnam, and my cousin who served in Iraq. But I’m also thinking about our troops whose boots are still on foreign soil, serving in the war in Afghanistan, and about their families who are holding down the home front until they return. 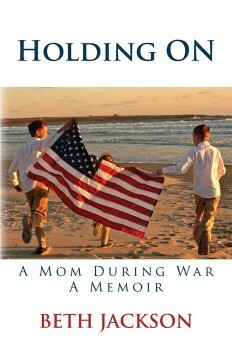 The book is called Holding On: A Mom During War by Beth Jackson. Beth happens to be a dear member of our extended family whom we don’t see nearly often enough, but as I read her book, I felt as though I was catching up on a part of her life that I knew nothing about. Her honest, heartfelt depictions of her family’s life prior to and during the deployment are utterly compelling and completely drew me in. Once I picked up her book, I didn’t want to put it down, and I didn’t want it to end. Reading Beth’s book was like catching up with a friend I hadn’t seen in a while over a glass of wine, and listening to her recount a recent and difficult period in her life. Beth is totally, almost brutally, honest with her story, which is not written as a tale of woe but of hope — a beacon for other military spouses whose life partner must suddenly depart for a dangerous war on the other side of the world, and on top of that, a war that seems largely forgotten in the public consciousness. I remember having a conversation with Beth at a family function, after her husband had returned but before she published the book. At the time, I thought it sounded very interesting to women whose spouses were serving overseas. Little did I know how much I would be drawn into her story — which in a broader sense is really about keeping one’s family afloat during a time of crisis. Her story brought back to my mind the biggest challenges that our family has faced over the years — how we have endured own times of crisis, and come out stronger on the other side. Beth’s strength is clearly evident, and it’s inspiring to read. It reminds me that as a parent, my kids will be watching me in times of crisis, and I want to provide them with the best example that I can. Beth’s unspoken message to her kids, delivered by her daily actions, was that no matter how bad things seem, your family members are your teammates and cheerleaders, and that together you can handle anything life throws at you. Throughout the book, Beth expresses a feeling of loneliness in her situation. Her family doesn’t live on a military base, where there may be other people who are experiencing the same thing, but in the suburbs, among civilians who have no idea what a military deployment entails for the entire family. Beth repeatedly expressed her desire for connection and community, but had to search very hard to find people who could truly empathize with what she was going through. This lack was particularly acute because many of her friends, family and neighbors (myself included) didn’t fully understand that her husband’s deployment was truly an extended crisis, and that they should check in with her from time to time to see how she and the family were doing. I’m deeply impressed by Beth’s willingness to share her experiences, with the goal of helping others in the same situation. When I think about the serious challenges our family has faced, I can’t imagine exposing them to the world in such an open, honest way. I admire her candid revelations, which I’m sure will help other women handle their own times of crisis, as the result of a military deployment or some different challenge. On this Veterans Day, I’d like to say a big THANK YOU to all our veterans, past and present — and to their families, who are all “holding on” until their loved ones return home safely. For the past six years, we’ve taken our summer vacation on the North Fork of Long Island, which I love, love, love. This year, because of the damage from Hurricane Sandy, we couldn’t stay in our normal spot, so we were considering a different vacation destination. I was near tears at the thought of replacing our relaxing week in the North Fork with a few days in Disneyworld. It did not sound appealing. I had never been to Disneyworld, and frankly, I didn’t think it would be for me: too expensive, too far away, too crowded, too…Disney. My experience with Disney during my daughter’s childhood has been through books, movies and TV shows which offer such facile platitudes as “Just believe, and all your wishes will come true.” Every time we heard something like that from a Disney character, I would rebut it with a critique: “Now, do you think all you have to do is wish for something and it will come true? If I wrote a song, it would say, ‘Set a goal, believe in yourself and commit to doing some good hard work towards that goal, and over the course of your life, perhaps your wishes will stand a better chance of coming true. '” Hmm, not quite as catchy. Anyway, I wasn’t keen on the idea of Disneyworld, but like multitudes of American parents I am a sucker at the thought of my 5-year-old daughter meeting A REAL LIVE PRINCESS, maybe even Ariel!!! So I relented, and we booked our trip. Last week we made the journey to Florida. We flew to Ft. Lauderdale, where we stayed for a couple of days to enjoy the beach — then mustered our courage and drove to the outskirts of Orlando for our 3-day, 2-night Magical Disney Tour. We arrived at Disney’s Polynesian Resort on Tuesday around noon. Immediately, we were immersed in what the Disney puppeteers behind the curtain must call “The Total Disney Experience.” Every single staffperson is a member of the Disney “cast,” and they are always putting on a show for you. Even the hotel janitor had to smile and cheerily say “Aloha! !” to us. One could remain skeptical for a little while in such a place, but soon the cheery friendly vibe puts you at ease. I’m not usually wordy with strangers, but during our stay I chatted freely with several of the “cast members” — knowing that they could not possibly do anything as un-Disney-like as be rude to A Disney Guest. Once we had checked in, we lost no time in jumping on the monorail to The Magic Kingdom. It was a short ride and a quick entry, and soon we were standing on Main Street, U.S.A., looking up at Cinderella’s Castle. It was impossible for us to escape the first day at Disney without buying something, so N got that darned Ariel wig she had been so worked up about before we left home. She put on the flaming red hair over her stringy brown locks (she has been adamant about washing and styling her own hair lately), so it looked pretty crazy — especially next to some of those little girls whose parents had booked appointments at the “Bibbidi Bobbidi Boutique” at Cinderella’s Castle, where the little girls had their hair whipped into curly up-dos, shellacked into place and glitter-fied before meeting all those real princesses. I never made an appointment for N at the Bibbidi Bobbidi Boutique. It seemed absolutely ludicrous and about five steps too far into The Frightening Disney Vortex of Perfect Princess-hood. I will admit to a few moments of weakness, when I looked at the birds’ nest of messy tangled hair atop my girl’s head, complete with a crooked Ariel wig on top of that. But as nice as it would have been to have her hair shampooed and detangled by someone other than me, I decided to instead be proud of N’s independence and self-reliance in fixing her own hair, birds’ nest or not. The next morning, we awoke early and arrived at the entrance to The Magic Kingdom in time for the morning welcome performance, at which Mickey and Friends arrive at the gates to The Magic Kingdom on the train and sing “Good morning!” to the crowd. I’m embarrassed to admit it, but I actually teared up. This was really The Magic Kingdom! That was really Mickey Mouse! They were really singing “Good morning!” to us! And my daughters are really 5 and 2, and to them, it’s all 100% real. As for shows, N, G and I loved the musical 3D-cartoon, Mickey’s PhilharMagic. I thought S would love it too, but she didn’t understand the concept of 3D and started to cry every time a character popped out of the screen towards her. The one experience I cannot recommend is Country Bear Jamboree, featuring backwoods bears with a southern accent singing such shocking lines as “Mama, don’t whup lil’ Buford, / you should just shoot him instead.” There is more surprisingly eyebrow-raising material, probably written in the 1970s, but I will leave it there. As far as dining, we ate at a few of the fast-food stops along the way. We enjoyed the Be Our Guest Restaurant at the Beast’s Castle, for which we made reservations in advance. But the absolute best dining experience — and perhaps the best experience of our trip — was brunch at Cinderella’s Castle (also with reservations in advance). We met Cinderella at the entrance, and a whole troupe of princesses visited all the tables: Snow White, Sleeping Beauty, Jasmine and (hallelujah!) Ariel. Wouldn’t you know it, N had to take a rather lengthy potty break in the middle of brunch. When we returned, I saw G from across the room holding up his hands, gesturing that all the princesses had left already. I was crestfallen, until one of the waitresses told me that the princesses were waiting for my daughter to return to her table!! They all made their way around to her and she got her picture taken with each of them. She was clutching my hand in every shot until she saw Ariel — then she got up her courage and took the picture with the princess by herself. Who says Disney isn’t magical?? While on the subject of a potty break, I’d be remiss not to mention that every single Disney Bathroom is immaculate. Seriously, if that is not a mom’s definition of the happiest place on earth, I do not know what is. We didn’t always have magical happy moments, though. N was hot, tired, cranky and a little bratty at times. Once, we stopped to get ice cream and she threw a loud hissy fit that it wasn’t the right flavor. 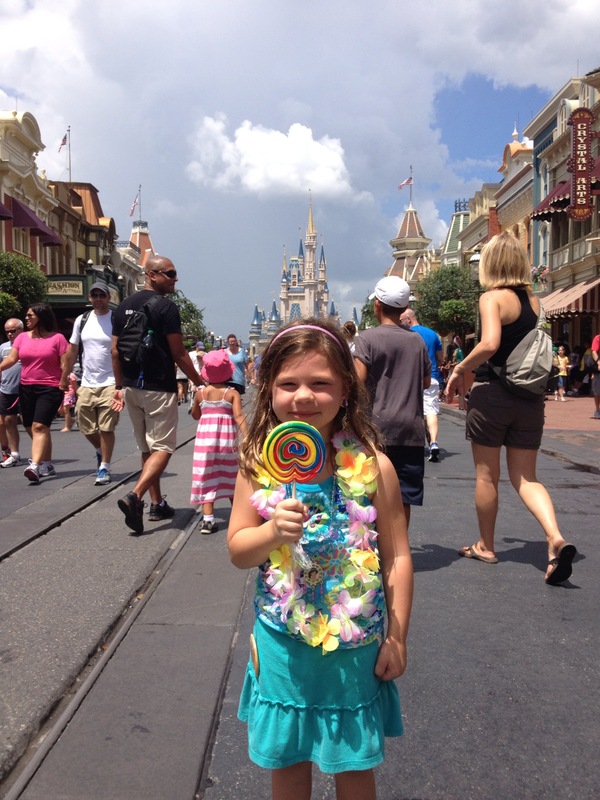 Horrified, I thought, “Oh my god, we are THOSE PEOPLE who go to Disneyworld and our ungrateful daughter throws a tantrum over something she can’t have! !” I told her point-blank that she was acting like a brat, something I never say to her but it certainly seemed accurate at the time. Thankfully, she quickly calmed down and even ate her ice cream. The double stroller saved us — it was totally worth the rental fee to have both kids off their feet and out of our arms, in their own seats. Still, by the end of each day N was exhausted. She had been excitedly anticipating the fireworks at Cinderella’s Castle, so one night close to 10:00pm (way past her normal bedtime), I took N down to the water’s edge at the resort to watch the display. We found a nice little spot on a sandy beach where she could sit in my lap. Almost as soon as the show began, she fell asleep in my arms. On the way back to our room, I gazed at the lighted silhouette of Cinderella’s Castle — that iconic symbol of everything Disney — and it hit home that I never had this experience as a kid. I never even asked to come to Disney, because I knew what my dad would say: it’s too expensive, too far away, too crowded, too Disney. And I knew he would always say no. But even though G and I both agree with his criticisms of Disney, we came to a different conclusion. We decided to bring our kids to this ridiculously-over-the-top place that was really built for them, where the magic does not come from a ride or a show or a trinket, but from being immersed in a place where a child can see her imagination reflected back to her — a place where everyone is kind, where fairies and princesses are real, where a little girl can go wherever her fancy takes her. It was worth it all just to have that experience. We probably won’t return to Disney every year, given the expense, but we’d love to go back in a few years when the girls are a little older and hopefully we’re a little wiser. Until then, I’ll be reliving the happy moments from this trip, and maybe wishing upon a star that I will remember many little details of this magical time of childhood innocence. Today N gave me a little scare: she decided to run away from home. It was the first time she has ever done that, and I sure hope it’s the last. N’s summer camp ended last week, so this week she and I have spent lots of quality time together at home. Of course, we are a typical mother-daughter duo — for all the giggles and fun times, there are as many little moments of hurt and anger. Sometimes we swing from one to the other in the space of a few minutes. Case in point — this morning was all fun and laughter until N suddenly, inexplicably, got REALLY upset that she couldn’t have the red-haired Ariel wig she saw in the store yesterday. When I tried to rationally explain why we couldn’t go back to Target to get the wig (“Um, honey, tomorrow we’re going to freakin’ DISNEYWORLD, so we really need to spend our time packing and getting ready”), she didn’t care. All that mattered was that she wanted the Ariel wig, she wanted it now, and I was the person standing in the way of her having it. As I sighed, I wondered — what in the heck would I do if she really did try to run away? “Honey, let me tell you a story,” I said. “I tried to run away once when I was 5 years old.” She stopped crying and listened intently. I told her that I got so mad at my parents that I packed up a suitcase and walked out the door. We lived on a farm, so I walked up the road behind the house, towards the fields. As I walked, I wondered — where would I go? Who would take care of me? After what seemed like an eternity, but what must have been only a few minutes, my dad found me. He was driving his tractor in the fields and picked me up, put me on his lap and drove me back home. I felt so good and so secure, and I never tried running away again. My story didn’t alleviate her hurt or her anger, so after a few more minutes I left her room, hoping she’d calm down — and slightly concerned that she would take an idea from my story and try her own little escape attempt. When I decided to “run away,” at least I had the good sense to walk through our own property instead of walking towards the public road. N wouldn’t have that choice here in Brooklyn; she’d be out on the street. What would I do if she sneaked out without me knowing and got lost on the streets of New York?? A few minutes later, she came downstairs and (thankfully) announced that she was indeed going to run away. I noticed that she didn’t have a suitcase in her hand, but she nonetheless walked towards the front door, with a few little glances at me over her shoulder. She was certainly pushing the boundaries to see how I would react. I sighed and commented that I would just have to run after her. She bolted out the door and down the street, so out the door I went too, right behind her. She jogged and I jogged. After we’d gone past a few houses, I commented, “You are literally running away from me right now.” We both started cracking up laughing, and that’s when I knew that everything would be okay. I hope there won’t be a “next time,” but if there is I asked if she could give me the heads-up a few minutes beforehand so I have time to go to the bathroom, grab my phone, etc. And I hope she got it out of her system today, while we’re still at home, before we trek through the airport tomorrow and through Disneyworld in a few days! I don’t want to be those parents with a “runner” on their hands!! Oy. In August 2007, when I was (very!) pregnant with N, G and I decided to take a weekend holiday on the North Fork of Long Island — to celebrate our wedding anniversary and to have one last baby-free vacation. There’s a picture of me and G standing on the ferry boat to Shelter Island, my big pregnant belly barely covered by a bright red t-shirt and my hair blowing wildly in the strong salty sea breeze. We loved the North Fork’s country atmosphere, the wineries, the farm stands, the beaches and the food — and thus an annual tradition was born. Every year, we load up the kids in the car and drive 2 hours to Greenport, Long Island, where we stay for a week of sun, sand and country living. It’s just our kind of place. Last year we found our dream vacation house. We rented a little beachside cottage from a lovely Italian man with a bountiful vegetable garden, who gave us arugula and tomatoes and had a bottle of prosecco waiting for us in the fridge. The cottage was steps away from a private sandy beach on one side; on the other, there was a big grassy backyard fronting a lake. The layout of the house was a little odd, having walls that didn’t reach all the way up to the ceiling — which meant that we could all hear each other quite well from room-to-room. Not such a bad arrangement for a family with little kiddoes — although the owner had nicknamed the house “Nessun Dorma,” which in Italian means “nobody sleeps”(!). In any case, we had lots of fun there. Unfortunately the house, like so many others, was wrecked in Hurricane Sandy. The Italian man put it beautifully: “As we always knew might happen, the ocean met the lake, and the house is no more.” He’s rebuilding, but the house wasn’t ready for us to stay there this year. We left Brooklyn by 9:30am and made it to Greenport a couple of hours later, in time for lunch. We took the girls to the carousel for a couple of rides, then walked over to the new Blue Canoe restaurant for lunch. The food is great and the view of the water from the deck is terrific. 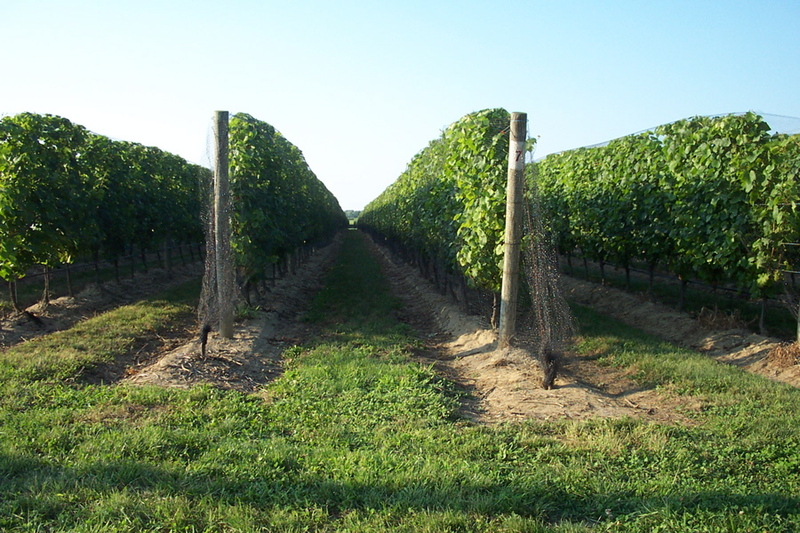 Once we were back on the road, we hit our two favorite wineries: Palmer Vineyards and Sparkling Pointe. We really enjoyed the case of wine we got last year at Palmer, and they have a cool old-fashioned looking tasting room. Sparkling Pointe is run by a Brazilian owner who hosts bossa nova music at their Friday night wine tastings (I am dying to go!!). They sell sparkling wine, and since G was driving I got to be the taster this year (oh yeah — nothing like downing 4 glasses of tasty champagne in 10 minutes at 2:00 in the afternoon while the kids are in the car! Woo hoo!). Our final stop was a place I can never get enough of, and would like to own someday: Harbes Farm. 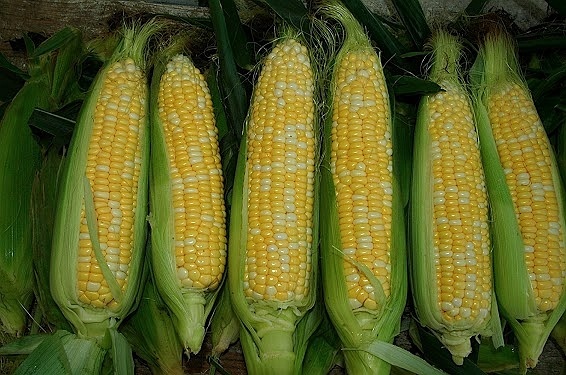 You name it, this farm stand has it — fresh produce and baked goods, corn fritters, roasted corn, pink lemonade, hayrides, a petting zoo, live music. (Yes, I am the “Stefon” of the North Fork!) I could stay there all day! I came away with bags full of fruits and veggies, a bag of sweet addictive popcorn and apple cider doughnuts. When they invent a transporter like they have on Star Trek, I am going there every day. Of course we got caught in terrible traffic on the Belt Parkway coming back to Brooklyn. But we had some yummy apple cider doughnuts to tide us over! This summer, N is attending a real summer camp for the first time. I’ve been surprised by what a learning experience it has been for both of us. Her day is filled with normal summer camp activities — swimming, tennis, games and arts and crafts. She’s making friends and likes her counselors. When she gets home, we relax and enjoy a homework-free summer evening. All of this is normal. What’s not “normal,” however, is our difficulty with the morning drop-off. N is the only 5-year-old Kindergarten graduate (among dozens) who still cries and clings to my leg, begging me not to leave. Granted, I’m sure there were several on the first day or two who did that. But several weeks into camp, my daughter is now the only kid making an emotional, embarrassing scene. At first my reaction was simply to cut and run. I’d pry her little arms from my leg, make sure she was being held by one of her counselors, and jog back to the car before she had time to follow me. I knew she was okay once I left — her counselors said she always got over it quickly. But still, I felt terrible that I had to leave her when she was so upset. After a couple of weeks, G and I got wise. We rearranged our morning dropoff schedule so that S and I could stay for a few minutes and hang out with N until her group went inside. Actually, this was N’s suggestion, and it has been working much better. Now, about half the time, she transitions into her group without too much trouble, playing with her friend while S and I wait with her. She’s still very sensitive and can get thrown off easily into crying mode, but now we‘re only experiencing emotional, embarrassing scenes about half the time. I guess that’s an improvement. Over the past few weeks, I’ve had to make some decisions about how to handle N’s behavior at dropoff. Clearly, it’s a stressful moment of her day. Was I going to scold her for crying and making a scene? For not acting like a big girl? For not behaving like the other kids? Truthfully, as I admitted to G one day after dropoff, I was disappointed in N. I felt discouraged that she didn’t handle her emotions at dropoff nearly as well as the other kids. All those other 5-year-olds said goodbye to their parents, then sat quietly with each other and talked until time to go in. My daughter is different. On a good day, when I stay with her, she gets excited and wants to run around on the grass instead of sitting down with the other kids. On a bad day, when she’s feeling sensitive and upset and a friend approaches her to say hello, she withdraws further, clinging to my leg — and is usually grumpy towards her friend. She’ll say something like, “I’m trying to be in private, I’m not ready to play,” but it comes across as grumpy and rude. When I heard myself expressing my disappointment in her, I realized — this sensitivity is part of the temperament that she was born with. It’s a trait that both her parents also have, as do other members of her family. Instead of criticizing her for it, I need to help her figure out how to handle her sensitivity in such a way that it doesn’t ruin her day (or anyone else’s). Growing up, I was a sensitive kid too. My dad, who seemed to be made of steel and was resolved to control everything and everyone around him, took it upon himself to “toughen me up.” This involved a lot of criticizing, which only made me feel bad about myself and led to self-esteem issues that I’ve battled all my life. G and I have decided on a different tack. We’re going to accept N for who she is, and we will demonstrate our acceptance. I’ve been consciously putting this into practice lately, just a general attitude of acceptance, and it is absolutely freeing. I’m not talking about an attitude of permissiveness when it comes to discipline or behavior, but truly accepting the person she is — even when she’s grumpy, or upset, or silly, or annoying, or weird. It actually feels really, really good to accept my child and love her for exactly who she is, and let go of the stress and agita of wishing she was someone she is not. To help her manage her sensitive nature — which can be a negative or a positive trait, depending on the situation — we’re going to try to help her interpret social situations more accurately. It’s a hard thing for kids, who don’t have the benefit of years of experience and a fully-developed brain, to correctly interpret other people’s behavior. So we’ll try to help her understand that just because your friend is playing with someone else, it doesn’t mean she’s not your friend anymore. And just because your favorite counselor tells you to stop doing something, it doesn’t mean she doesn’t like you anymore. And when she’s feeling sensitive and easily upset, we’ll reassure her of our love. When appropriate, we’ll keep repeating our family’s mantra to her: “Let it roll off your back.” She has started to internalize this mantra (and to repeat it back to me when I have a hard time letting something go!). For me, this summer camp experience has taught me a great deal about N. About how she reacts in certain situations, and perhaps how we can help her overcome her specific challenges and become the best version of herself. This week I’m taking a break from the serious stuff to post some pictures of our “kitchen creations” so far this summer: homemade ice cream (the shortcut! ), beans with broccoli leaves (yes, broccoli leaves! ), and grilled veal chops with garlic-lemon rub (thank you ICE cooking class!!). Recently N has been attempting to make her own ice cream. Her most creative effort: adding orange juice to the leftover milk from her cereal bowl, trying for something like orange sorbet. “Mom, let’s put it in the freezer, and by the time we get home from school it will be ice cream!” N said excitedly. I had to be Scrooge and tell her that it probably wouldn’t work that way. I figured that we’d have to buy an ice cream churn to make homemade ice cream, but that just sounded like a whole lot of old-fashioned work, akin to scrubbing our laundry on washboards. Then, browsing through the aisles at Walgreens, I saw the “Ice Cream Magic Personal Ice Cream Maker (As Seen on TV! ).” With this nifty gadget, you “shake it to make it!” For $9.99, I thought we’d give it a try. The directions were easy to follow: fill the bottom part of the ice cream maker (designed in a cute cone shape) with crushed ice, water and salt. In the top part, you put your ingredients: for vanilla we used heavy cream, vanilla extract and sugar. Shake it for 3 minutes (or a little more) — and voila! You have…runny ice cream. It tasted good, but it looked more like melted ice cream than fresh-churned scoops. 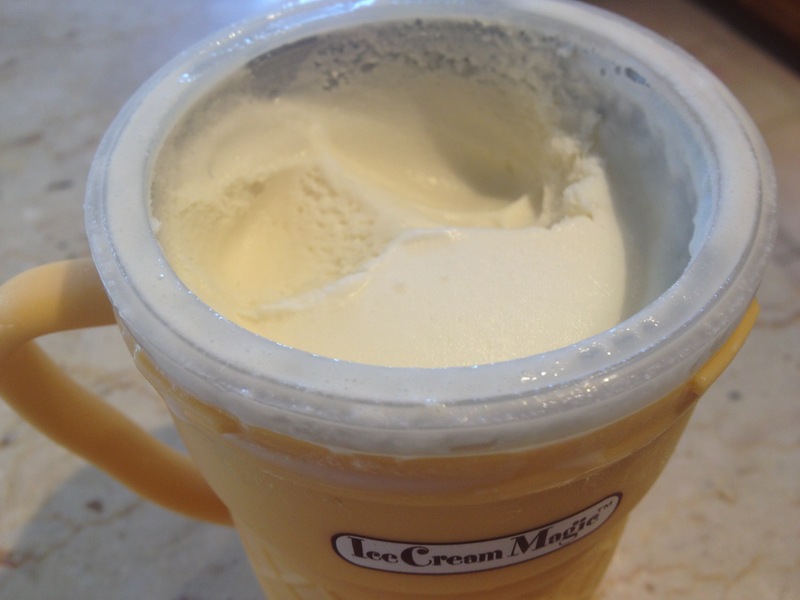 But it was easily fixed: we stuck it in the freezer for an hour, and voila! You have real ice cream! It was very tasty and just the right consistency. It only produced one scoop (hence the “personal ice cream maker”), but that was okay with us. I liked it because N got to see the actual ingredients and method for making real ice cream. So maybe she won’t be mixing her orange juice and milk after breakfast anymore! When our Italian neighbor saw us growing broccoli in our backyard, she exclaimed, “Oh! Give me the broccoli leaves, I make you something good.” I was confused — didn’t she want the actual broccoli? No, she assured us, the leaves were delicious. I had never heard of cooking broccoli leaves, but “Jojo” (as our kids call her) has never led us astray where food is concerned, so we gave her the leaves and waited to see what would happen. 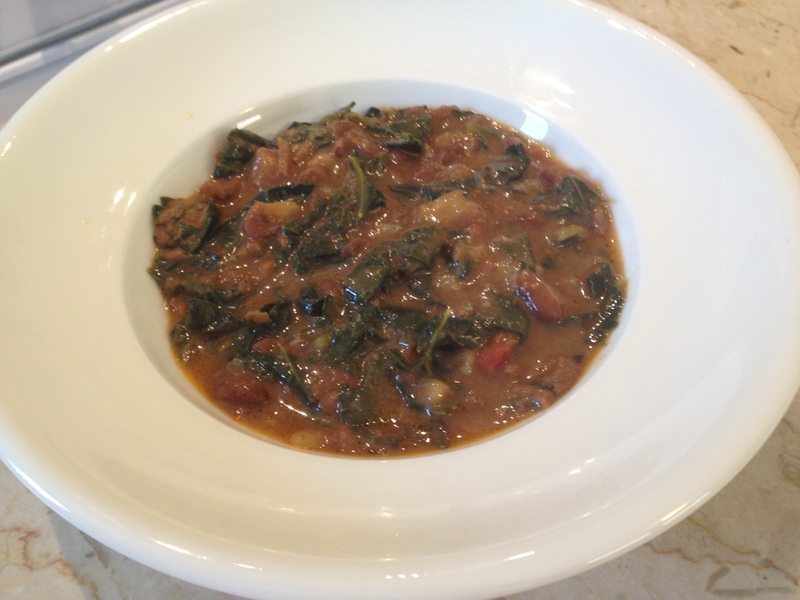 The next day she brought me a warm dish of red beans with the broccoli leaves, chopped and wilted into the sauce. She explained, in her incomparable Sicilian way, that first you cook the red beans; next you saute chopped onions; add crushed tomatoes; simmer for a while, then add the chopped broccoli leaves. I tried her dish, and it was divine! Now she’s going to teach me how to “peel” the broccoli leaves (not sure what that means-?). When I make it, I may mix in some chopped kielbasa, which I think would be an excellent addition. I don’t have much experience with veal, but I’m always up for trying something new. So I was glad to see veal chops on the menu at the cooking class I took a few weeks ago at the Institute of Culinary Education (ICE). 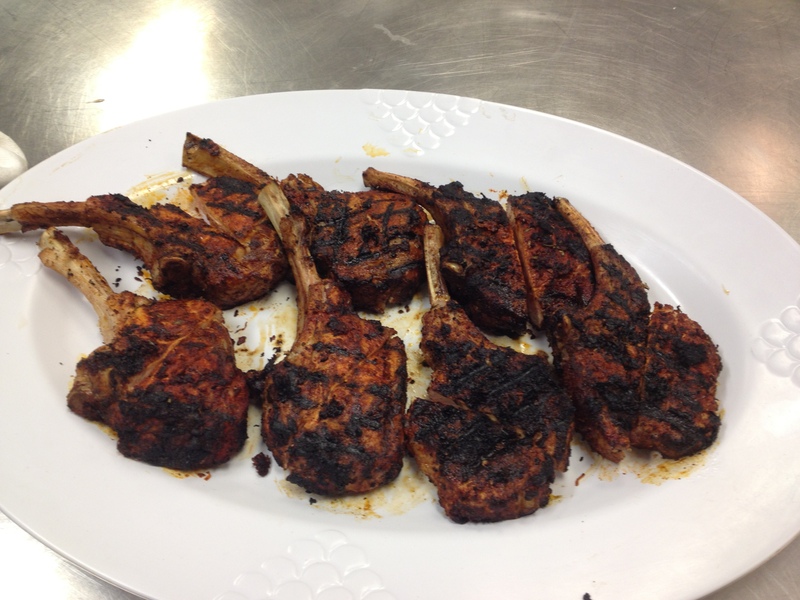 I took this picture of the veal chops we made in the ICE class. The chops were grilled a bit, then rotated and grilled some more on the same side — which gave it the nice criss-cross grill look that you get in restaurants. The veal meat was very tasty. It was light in color, similar to pork chops. The rub itself was easy — and delicious. So there you go, the first installment of Summertime YUM, Brooklyn edition. Next on the menu: raspberry mojitos, cucumbers marinated in vinegar and sugar, blackberry dumplings and fried squash. I’m getting hungry just thinking about this summer! !